Why Not Come On Board! It’s a great way to meet, network and socialise with Mayo people in the capital. – including the Summer BBQ, the November Business Lunch, our Christmas Party, the Mayo Awards Banquet, in addition to other business, cultural and social events throughout the year. All members will receive seasonal newsletters, regular news updates and invitations to our wide-ranging events by email! If you wish to download the application form and post it to us with the Membership Fee please click the link below. Pictured are members of the Executive Committee and Officers elected at our Association’s AGM on 23 April for 2018-2019. (Standing l-r): Noel Howley, Diarmuid McLoughlin, Maeve McLoughlin, Keith Guthrie, Orla Crowe, Paddy Moran, Teresa Ruddy, Adrian Neary, Aoife Neary, Cian Durkan, Rosanna Loftus, Laura Daly, Mark Duffy, Helena Kelly, John Costello, Mairead Fleming, Derek Reilly and Bernadine Walsh Cummins. (Seated l-r): Orla Fitzpatrick, Frank Fleming, Grace Heneghan, Eddie Melvin, Julie Doyle, Dr Mona McGarry, Fr Gerry French and Michael Kealy. Executive Officers 2018-2019 – Derek Reilly (Public Relations Officer), Orla Fitzpatrick (Vice-Secretary), Julie Doyle (Chairperson), Eddie Melvin (President), Grace Heneghan (Secretary), Michael Kealy (Treasurer) and Fr Gerry French (Vice-President). 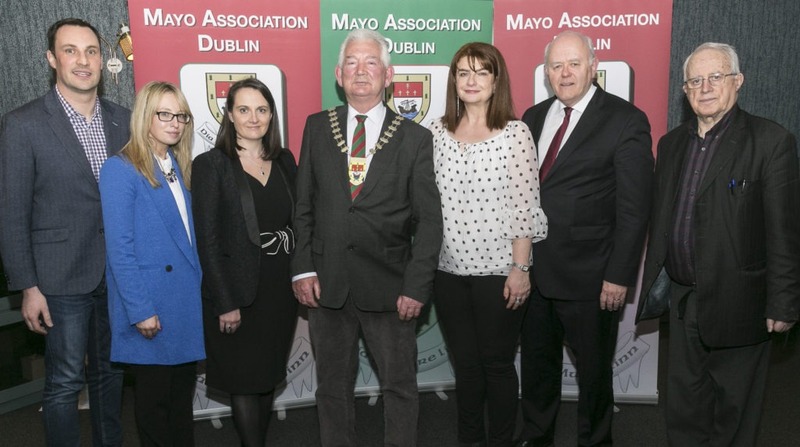 Retaining their officers’ posts this year – Chairperson Julie Doyle (Swinford), Treasurer Michael Kealy (Newport), Secretary Grace Heneghan (Ballinrobe), Vice-Secretary Orla Fitzpatrick (Dublin), and Frank Fleming remains our Honorary Life President. Meanwhile, Eddie Melvin (Ballina) has taken over the Presidential Chain of office from Dr Mona McGarry, Derek Reilly (Belmullet) is the newly-elected Public Relations Officer, while Fr Gerry French is our new Vice-President. Frank Fleming remains our Honorary Life President. Please click the link below if you wish to contact us and we will get back to you as soon as possible.